Designed for people whose diets don’t meet all of their nutritional needs, multiple vitamin–mineral supplements (“multivitamins”) are convenient nutrient combinations, usually taken one to six times per day. While it’s generally agreed that a healthy diet is the best foundation for health, everyday life makes that goal challenging for many people. So, some people supplement in hope of preventing disease-causing deficiencies and providing higher nutrient amounts than they can get through diet alone, which may help prevent or manage certain diseases. Recommended dietary allowances (RDAs) have been developed by a scientific panel to broadly cover healthy people of any age or gender. Used to design mass food programs, such as for the armed forces and food relief/ration programs, RDA’s were the basis for the Reference Daily Intake (RDI) values, which the US Food and Drug Administration (FDA) uses to create the Daily Value (DV) packaging labels. 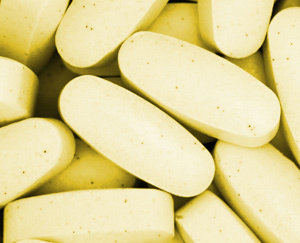 Many multivitamins contain at least 100% of RDA recommendations. However, decades of research on human nutrition has led many researchers and healthcare professionals to conclude that a “one-size-fits-all” approach does not address the increased need for certain nutrients by people who are not healthy or by those at increased risk of developing various diseases due to genetics or lifestyle habits. The RDA does account for this increased need in certain cases such as, vitamin C for smokers, or vitamin D for seniors. Abundant research also suggests therapeutic benefits to supplementing with certain nutrients, even when eating a healthful diet. Low-potency/one-a-day multiples. These mixtures often contain 100% of the daily requirements for most vitamins and some minerals that many people require. However, they do not provide enough to make up for deficiencies or other therapeutic amounts. For example, people eating a Western diet may be deficient in minerals such as calcium and magnesium, which one-a-days may not help correct. High-potency multiples. These mixtures may provide higher amounts of desired nutrients sometimes designed to support particular health goals, such as heart health. To evenly distribute nutrition to the body, these are convenient combination products usually designed to be taken as caplets or tablets in divided doses, depending on the formula. Timed-release. Some healthcare professionals assume that releasing vitamins and minerals slowly into the body over a period of time is better than releasing them all at once. However, except for some studies showing better absorption of time-released vitamin C, this assumption has not been well studied and some concerns have been raised about the safety of the chemical agents used to cause the timed release. Vegetarian. Most capsules are made from animal gelatin, so vegetarians need to carefully read supplement labels to ensure they are getting a vegetarian product. Capsules vs. tablets. Occasionally B vitamins react with a product’s other ingredients, especially when exposed to moisture or heat; this can cause discoloration and a bad smell. While the multiple is still safe and effective, the smell is off-putting and usually not very well tolerated. Liquid multiples in a soft-gel capsule—or tablets or capsules that are kept dry and cool—do not have this problem. Capsules are usually smoother than tablets, so some people find them easier to swallow. Properly made tablets and capsules will dissolve readily in the stomach, allowing the nutrients to be absorbed. Chewables. Multiples do not taste very good and to make them palatable to both children and adults, bad-tasting ingredients are reduced or eliminated and the rest are masked with a sweetener (sometimes more sweetener than any other ingredient). Debates continue, but healthcare professionals generally recommend avoiding regular consumption of both artificial sweeteners like aspartame (NutraSweet®) and sugars. (Xylitol, a natural sugar, does not cause tooth decay or other known problems but is rarely used in chewables because it is relatively expensive.) Chewable vitamin C products should contain buffered vitamin C, rather than the acidic form (ascorbic acid), to avoid damaging tooth enamel. Nothing beats a nutrient-rich, whole foods diet as a foundation for good nutrition, and quality supplements may help support that goal. While a whole food diet is the preferable route, a high-quality multivitamin might be recommended for children eating an unbalanced diet. In one double-blind trial, schoolchildren received a daily low-potency vitamin-mineral tablet for three months that contained 50% of the RDA for most essential vitamins and the minerals. About 20% of participants (working class, primarily Hispanic, children, aged 6 to 12) experienced dramatic gains in certain measures of IQ, possibly due to correction of specific nutrient deficiencies in these children. However, it was not possible in this study to identify which nutrients caused the improvement.